This article is part of our Longyear for Kids series, written with our younger audience in mind. See other articles in the series here. Long before airplanes and cars, scooters and skateboards, people used horses to get from one place to another. They rode on horseback, traveled in horse-drawn carriages and wagons, and in the wintertime, glided over snowy roads in sleighs. Like many other New Englanders, Mary Baker Eddy loved riding in a sleigh. And with heaps of snow blanketing the countryside each winter, she had plenty of opportunity to do so when she was growing up — and later in life, too. James F. Gilman, the artist who illustrated Mary Baker Eddy’s book Christ and Christmas, drew this charming winter sleighing scene. Original artwork, 1991.017.1285, Longyear Museum collection. Sleighs gave people in earlier centuries a way to leave their homes in winter in order to visit family and friends, attend parties and social gatherings, and on Sundays make their way to church. There were no snowplows in those days, and “after a blizzard the men and boys ‘broke out’ the roads” — harnessing teams of oxen to sleds and sleighs and chaining a log or heavy board between the runners to help flatten the snow as they traveled from farm to farm.1 Later in the 19th century, horse-drawn snowrollers were used instead. Sometimes, snow was even added to roads — especially inside New England’s many covered bridges — to ensure smooth travel! 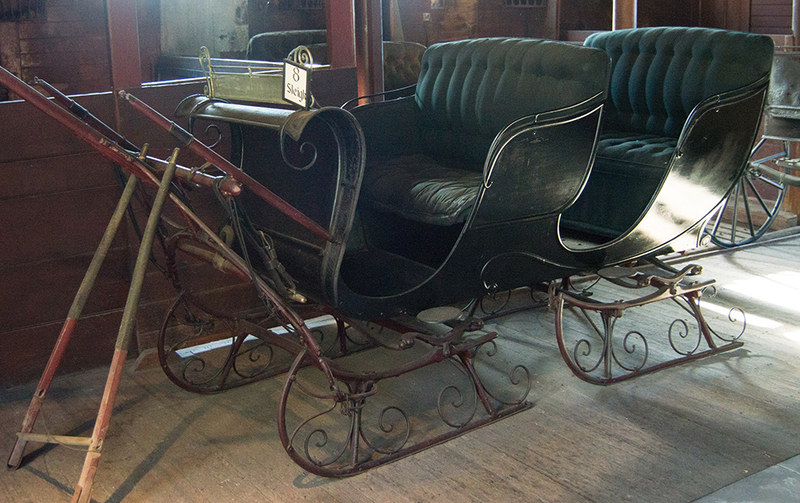 A sleigh that Mary Baker Eddy owned later in life. Artifact, 2007.002.0018, Longyear Museum collection. Winter was “the most sociable season, for it was easy to get around…by sled or sleigh, and everyone had extra free time.”2 There were quilting bees, and spelling bees, and Sunday suppers after the Sabbath ended, among other activities. Horse-drawn snow roller, circa 1900. Tennie Toussaint Photographs, Special Collections, University of Vermont Libraries. A farming family heads out for a sleigh ride in “American Homestead Winter” by Currier & Ives. A couple enjoys a sleigh ride in the 1850s in "The Road – Winter" by Currier & Ives. Some of Mrs. Eddy’s household helpers enjoying a sleigh ride in Chestnut Hill, Massachusetts. Scrapbook, LMDB-10798, Longyear Museum collection. Cars (or automobiles, as they were generally called back then) were invented around 1885 and began gradually replacing carriages and sleighs as a means of transportation. Mary Baker Eddy would own a number of automobiles in her lifetime. Although the people who worked in her household enjoyed them, she herself rarely ever used them, much preferring to ride in a carriage.10 “[S]he liked to watch the horses,” notes her friend Adelaide Still. In winter months, the wheels on one of her carriages were replaced with runners (similar to skis) to make gliding on the snow easier. 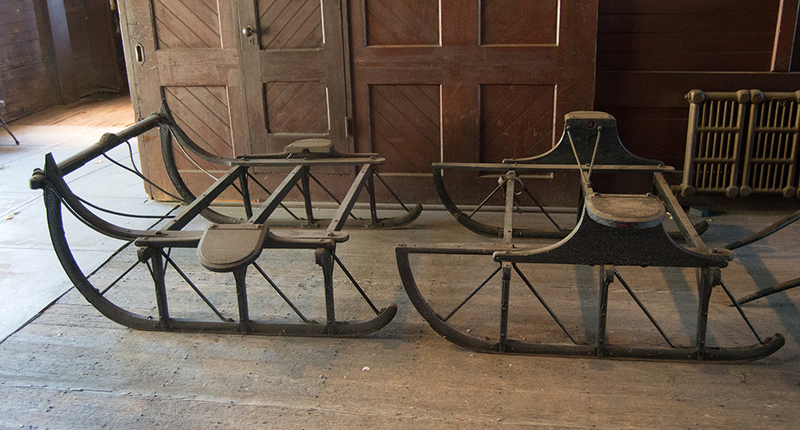 A set of sleigh runners on display in the carriage house at 400 Beacon Street, Mrs. Eddy’s last home in Chestnut Hill, Massachusetts. Artifact, 2007.002.0021.1&2, Longyear Museum collection. John Salchow, Mrs. Eddy’s handyman and groundskeeper, was one of the people responsible for putting the runners on Mrs. Eddy’s carriage in the winter. 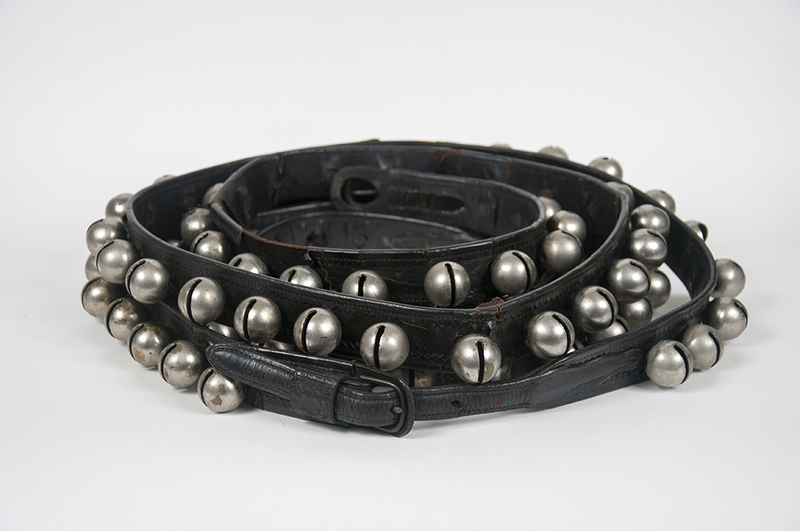 Sleigh bells belonging to Mrs. Eddy. Artifact, 2016.002.0015.1&2, Longyear Museum collection. Mrs. Eddy’s students and helpers enjoyed sleigh rides, too. Adam Dickey, one of her secretaries, had grown up in Canada and was accustomed to driving sleighs. He stepped in as Mrs. Eddy’s driver once when there was a need. “I assured her that I was quite capable of performing this service for her and would be overjoyed to do it,” he later recalled.13 Much to her delight, Mrs. Eddy did not have to miss her sleigh ride that day. 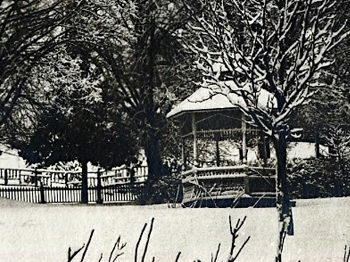 For Mrs. Eddy, her daily rides in carriage or sleigh were not just a “cheery vacation.” She told another friend and helper, “I have uttered some of my best prayers in a carriage.”14 For her, these outings each day were not only a time for fresh air and new views, they were also a time to pray — something she loved to do even more than sleigh riding! 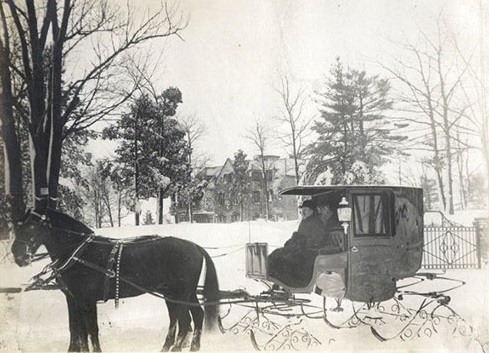 Mrs. Eddy on a sleigh ride near her home in Boston. Can you spot the sleigh bells on the horses? 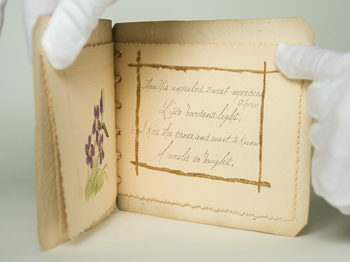 Scrapbook, LMDB-12031, Longyear Museum collection. Would you like to see the carriages and sleighs that Mrs. Eddy rode in? We hope you’ll come visit us at Longyear Museum so we can show them to you! If you’ve never seen a real live horse and sleigh, click here to watch an antique sleigh rally at Old Sturbridge Village! Here’s a horse and sleigh for you to download and color! 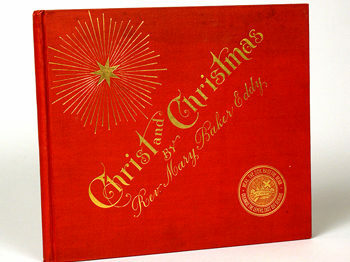 Click on the audio clip below to hear Mrs. Eddy’s sleighbells! 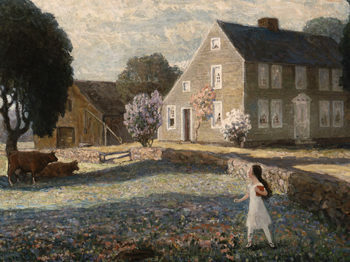 Elizabeth Gemming, Huckleberry Hill: Child Life in Old New England (New York: Thomas Y. Crowell Company, 1968), 16-17. 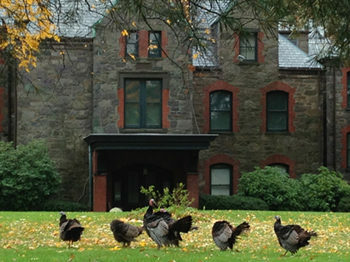 George J. Cummings, “Life at North Groton in the Nineteenth Century” in Longyear Museum Quarterly News 10, no. 3 (1973). Read online here. Jewel Spangler Smaus, Mary Baker Eddy: The Golden Days (Boston: The Christian Science Publishing Society, 1966), 20. Mary Baker Eddy to Clara Louise Burnham, Sept. 21, 1902, L08338, The Mary Baker Eddy Collection, The Mary Baker Eddy Library, Boston, Massachusetts (hereafter referenced as MBEL). “Every ox tea or tea of horses could be identified by the sound of its bells, for each set of bells had a different tone.” Elizabeth Gemming, Huckleberry Hill, 20. Isabel Ferguson and Heather Vogel Frederick, A World More Bright: The Life of Mary Baker Eddy (Boston: The Christian Science Publishing Society, 2013), 29. See also Jewel Spangler Smaus, “Family: The Carolina Glovers, Part IV” in Longyear Museum Quarterly News 26, nos. 4 & 5 (1989-90). Read online here. Mary Baker Eddy to Martha Pilsbury, March 5, 1848, L11150, MBEL. Mary Baker Eddy to Joshua F. Bailey, March 16, 1890, L10707, MBEL. M. Adelaide Still, “Reminiscences of the Time I Spent in Mrs. Eddy’s Home,” 20, MBEL. Mrs. Eddy rode in an automobile only once or twice, according to Miss Still, who served as her personal maid. John G. Salchow, “The Privilege of Serving Our Leader,” We Knew Mary Baker Eddy, Vol. 1, Expanded Edition (Boston: The Christian Science Publishing Society, 2011), 383. Letter from Mary Baker Eddy to Gilbert C. Carpenter, Dec. 21, 1902, L14133, MBEL. Adam Dickey, Memoirs of Mary Baker Eddy (Boston: Lillian S. Dickey, 1927), 36. Mrs. Eddy made this statement on November 20, 1910. William Rathvon, “Reminiscences of William R. Rathvon, C.S.B.” 81, MBEL. Another time, as she was stepping into her carriage, Mrs. Eddy told her friend Maurine Campbell: “This is my time for communion with God.” Maurine Campbell, The Story of the Busy Bees: An Account of Pioneer Experiences in Christian Science, 38, MBEL.